Music festivals, it’s fair to say, are on something of a relentless rise. Combining a weekend of hedonism with the opportunity to see musicians that would cost far more to see individually, the events present a risky but potentially rewarding opportunity for businessmen. 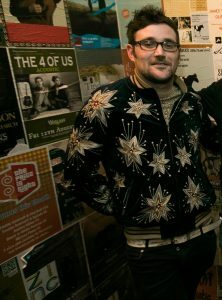 With the country’s biggest festival Electric Picnic selling out before even announcing a lineup this year, newcomers have been consistently sticking their head above the parapet – alongside BARE, festivals like Live On Air and BD Festival are nudging into the scene. BARE in the Woods, a growing event in Garryhinch Woods, Portarlington, is perhaps the most successful newcomer. BARE In The Woods’ lineup is notably different to much of what’s going on in Ireland over the summer: some of the acts come straight out of leftfield (like sharp, political deep-thinking rapper and spoken word artist Akala, or former frontman with The Streets Mike Skinner), while others – like Canadian pop starlet Kiesza – are playing rare Irish dates. The progression over recent years – from one-day festival featuring almost exclusively local Irish acts to three-day bonanza layered with international diversity – is a promising sign. And once it’s all done? There’s only one way Peter can unwind. “I think I’ll have Post Traumatic Stress Disorder for about a month, so I’ll be taking some time off,” he tells us, “but then I’ll be heading off to a few festivals around Europe as a punter, and to see what they’re up to.” Of course he will. BARE In The Woods takes place in Portarlington, county Laois on June the 9th, 10th and 11th. 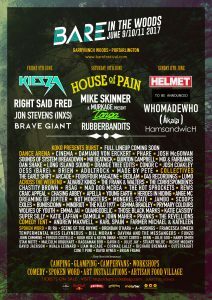 The line-up features Kiesza, House Of Pain, Right Said Fred, Mike Skinner, Helmet, Rubberbandits and Ham Sandwich. This article is part of my weekly music column for the Dublin Gazette, reproduced here with permission. Note: this column is published in the Dublin Gazette several days ahead of on this website, so at times, some columns may be slightly out of date. The Gazette is a freesheet paper available across Dublin, published on a Thursday. Pick up copies at these locations.